Whole Clove from Madagascar. The biggest clove market is of course Indonesia and India. Middle east also uses them a lot. Available CG3, Zanzibar, Lemur. Feel free to inquire. Indonesia produces their own cloves for domestic consumption and also for export. 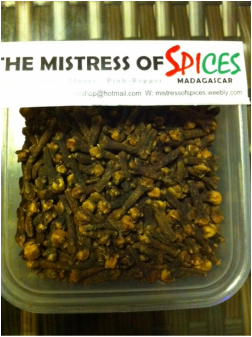 Our Cloves chosen here are gourmet grade, hand-picked and limited in quantity and source directly from Madagascar. The cloves that we bring in, are from the East Coast of Madagascar. The main flavour is from the Eugenol oil in Cloves, which is used extensively as food ingredients, flavourings, antiseptic and anesthetic. You can make Clove tea or Coffee. My colleague told me she likes buying spices in its natural form and grind it into powder for her Tea. Chai - Cloves as one of the key spices!